In May of 2015, at 47 years old and in the prime of my life, I was diagnosed with Stage 4 ADENOCARCINOMA. This is a type of Non-Small Cell Lung Cancer. The cancer had spread to my lymph nodes and bones after originating in my lungs. The 5 year survival rate for my cancer is 3% and the condition is considered to be incurable, or in the long game, terminal. I sought my treatment at Seattle Cancer Care Alliance under the care of Dr Keith Eaton and Jennifer Jacky ARNP. My cancer treatment started in June of 2015 and included traditional chemo-therapy that was administered by infusion every 21 days. The cancer was minimized and stabilized by this treatment. I completed 30 rounds of this chemotherapy over the course of 22 months. In April of 2017 my scans showed incremental growth in my lymph nodes. My cancer cells had been tested and determined to have a ROS1 mutation. There is a targeted therapy for this mutation, so at this time (April 2017) I switched to a drug called Xalkori. This is essentially an oral form of chemotherapy that is specifically designed to interrupt the ROS1 driver for my cancer. The goal of my treatment is long term chronic management. I will be on some form of treatment for my cancer for the rest of my life. I have teams of amazing providers working hard to keep me alive and there are great treatment options on the horizon. So what is this “Hold Fast” thing? I grew up in a nautical family, my father was a Navy and Coast Guard veteran. I served four years in the Coast Guard. My brother is currently in the Coast Guard and serves as the base commander in Boston, Massachusetts. Hold Fast is a nautical term used for centuries. To me, it means to persevere and grit it out even in the worst of conditions. After my father and hero passed away in 2011, I had Hold Fast tattooed on my knuckles as a memorial to him and a reminder to myself to stay the course every day and persevere through hard times. When I was diagnosed, a photo of my tattoos accompanied the blog post that announced my diagnosis. This photo took on a life of its own, creating a brand and a support movement built by my community. 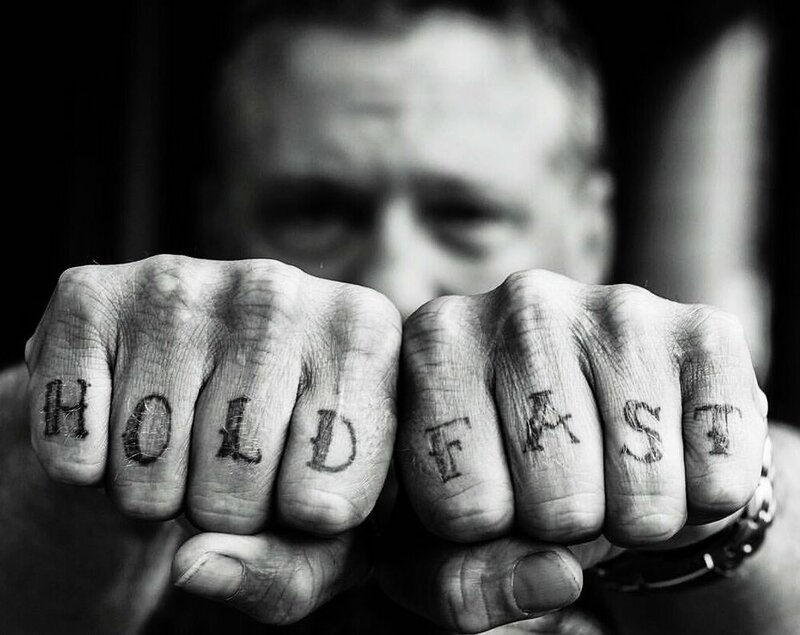 Hold Fast became my mantra in my battle against this deadly disease. The Hold Fast attitude has been a rock of my battle and I want others to find comfort here as well.